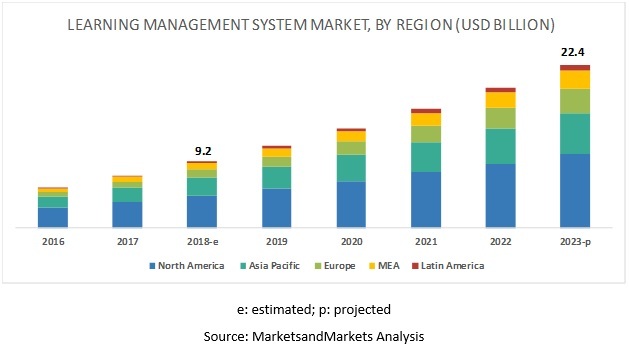 [159 Pages Report] The LMS market size is expected to grow from USD 9.2 billion in 2018 to USD 22.4 billion by 2023, at a Compound Annual Growth Rate (CAGR) of 19.6% during the forecast period. 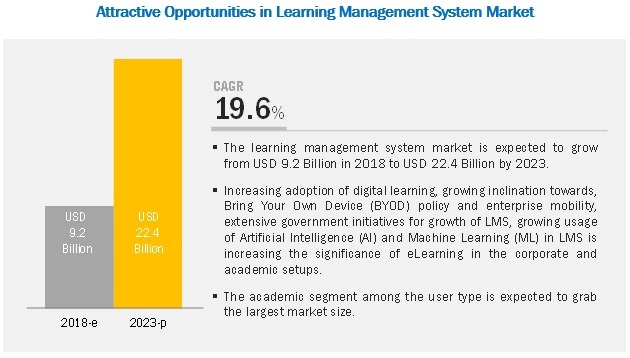 The major growth drivers for the market include increasing adoption of digital learning, growing inclination toward Bring Your Own Device (BYOD) policy and enterprise mobility, extensive government initiatives for the growth of LMS, growing usage of Artificial Intelligence (AI) and Machine Learning (ML) in LMS is increasing the significance of eLearning in corporate and academic setups. The adoption of cloud deployment type for LMS in the training and development structure is growing rapidly. Most of the vendors are switching from on-premises deployment mode to cloud-based solution. Cloud-based LMS providers are actively delivering continual innovation with security in priority. Some of the LMS cloud providers include SumTotal Systems, Docebo, SAP, Epignosis, ScholarLMS, and Expertus. The global market for the cloud-based LMS solutions is expected to rise at a substantially high rate in the next 5 years. As businesses have become more competitive after the second wave of globalization, the importance of human resources has increased significantly over time and employee training and development has become a new norm. In various corporate organizations, industrial methods used for training and development are different. For instance, the success of a software and technology company largely depends upon the skill/ability of the employees in the organization. Skill and knowledge required in the software and technology companies change at a faster pace compared to other industries. Research and development also play a key role in software and technology companies. To keep improving the skills of the employees, LMS in the software and technology companies is of key importance. Medical practitioners need to update their knowledge and skills to provide the latest treatment to the customers/patients. Keeping employees updated with new medical devices and pharmaceutical products is another key aspect of the training and development module in the healthcare sector. Advanced eLearning technologies like 3D images of internal organs and live interaction with experts have increased the effectiveness of the eLearning in the medical sector. The global LMS market, by region, covers 5 major geographic regions: North America, Asia Pacific (APAC), Europe, Latin America, and MEA. North America is estimated to account for the largest market size during the forecast period. In this region, enterprises are now shifting to mLearning for better results and convenience of use. LMS is used by both corporate users as well as academic institutes, and most of the vendors offer user-centric product development strategies and cater to all technological demands and innovative needs for both the academic and corporate sector. North America has shown speedy acceptance of new learning pedagogies and this has further pushed the LMS market for this region. Owing to the advanced technology present in the region, students are digitally more connected and aware of eLearning and interactive course content. Even teachers and parents are sensing the need to shift from old teaching methodologies to newer and advanced ways of teaching and learning pedagogies to improve the learning experience and educational technology for the students. 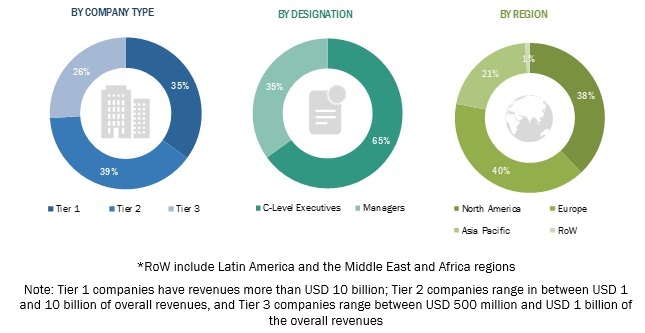 The study includes an in-depth competitive analysis of these key players in the LMS market with their company profiles, recent developments, and key market strategies. In March 2017, Blackboard launched the SaaS deployment model of Blackboard Learn. The new SaaS solution can be deployed through AWS. In October 2017, Schoology Partnered with Aeries Student Information Systems to cater to California district school. What are the opportunities in the LMS market? How has smart classroom evolved from the tradition classroom? What are the dynamics of the LMS market? *Details on Business Overview, Products/Solutions/ Services Offered, Recent Developments, SWOT Analysis, and MnM View Might Not Be Captured in Case of Unlisted Companies. The study involved 4 major activities to estimate the current market size for the LMS market. Exhaustive secondary research was done to collect the information on the market, peer market, and the parent market. The next step was to validate these findings, assumptions, and sizing with the industry experts across value chain through primary research. Both top-down and bottom-up approaches were employed to estimate the complete market size. Thereafter, market breakdown and data triangulation were used to estimate the market size of the segments and subsegments. In the secondary research process, various secondary sources, such as Hoovers, Bloomberg BusinessWeek, and Dun & Bradstreet, have been referred for, to identify and collect information for this study. These secondary sources included annual reports, press releases and investor presentations of companies, white papers, certified publications, articles by recognized authors, gold standard and silver standard websites, LMS technology Research and Development (R&D) organizations, regulatory bodies, and databases. This research report categorizes the LMS market based on component, delivery mode, deployment mode, user type, and regions.